When I was at school, in the sixth form, I took part in a play. It was a production of George Bernard Shaw’s Saint Joan. The play is a dramatization of the trial of Joan of Arc. In Bernard Shaw’s play she is neither saint nor sinner, but “a great middle-class reformer.” (To quote TS Eliot, who disliked what Shaw had done with her). The play was one of our prescribed texts for the final A-level examination in English. In the performance I played Peter Cauchon, Bishop of Beauvais (the second best part after Joan herself). It was a great experience and I still remember a couple of incidents associated with the production, but the one thing that has stayed with me from the printed text wasn’t actually in the play, but in Shaw’s Preface. Bernard Shaw was more than a playwright, he was a thinker and an activist. He used his plays as campaign tools. He wrote the play and Preface to Saint Joan while involved in campaigning, in support of the National Council of Women of Great Britain and Ireland, to get the wording changed on a monument. 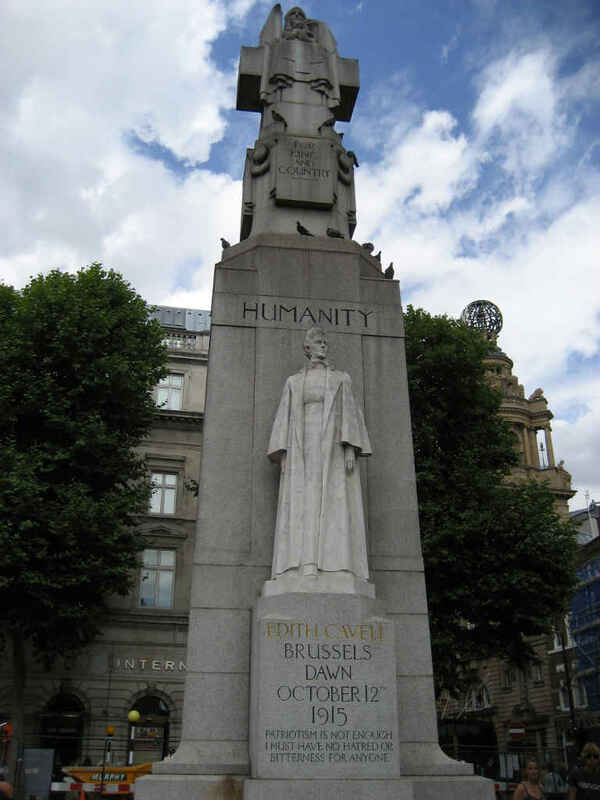 The monument in question was the memorial to Edith Cavell. – the place and date of her execution by a German firing squad. The monolith behind her, above her head, is inscribed Humanity. Above that is the conventional contemporary statement: For King and Country. On the back is a symbolic representation of a lion (Britain) crushing a serpent (Germany). What the National Council of Women and Shaw were protesting was the way in which Edith Cavell had been hijacked. Hijacked by the establishment (King and Country) and used as propaganda to support the war effort. Used also to portray Germans as, well, serpents. Edith Cavell was an Englishwoman in occupied Belgium. As a nurse – in fact the matron of a school training nurses – she followed her calling. She made sure her hospital cared for anyone who came through the doors. At the beginning of the war, that meant local civilians and Belgian and German wounded. Later she cared for wounded soldiers of the Allied armies who found themselves caught behind German lines. 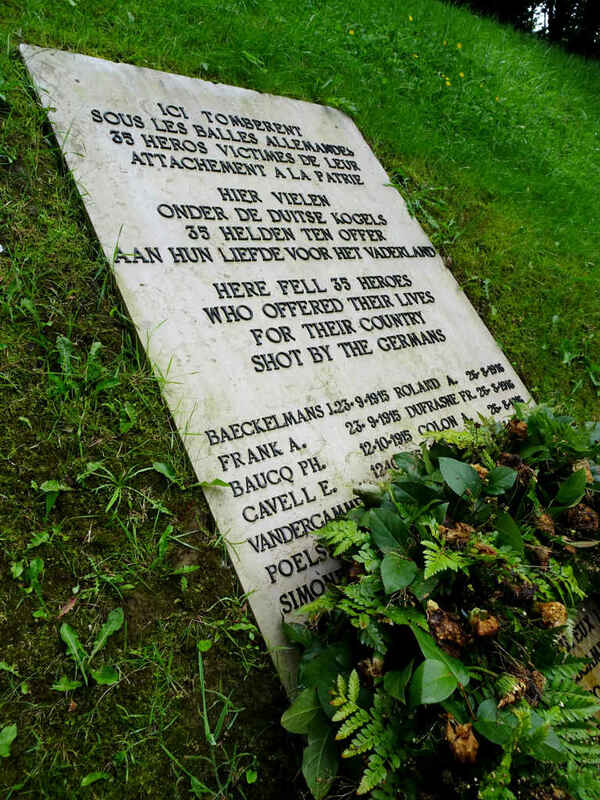 She was also involved in the early stages of a network of Belgian resistance that found the men behind the lines of the Western Front, helped them east to Brussels and then, once they were recovered, smuggled them on to the relative safety of the neutral Netherlands. The network, and her involvement with it, appears to have been a consequence of a domino effect of chance events. Agreeing to take care of one soldier led on to a second. Two soldiers led to ten, to fifteen, to twenty. Once these men were sufficiently recovered she was keen to see them move on and release their places for the next batch coming in. Some sort of system had to be developed for getting them through German occupied Belgium and across the frontier. The network was never centrally organised or carefully designed, growing organically. But once it came to the notice of the occupying power, they set out to expose it, roll it up and arrest everyone involved. In the end around 70 people went on trial. Edith Cavell, as the only Englishwoman involved, was painted by the authorities as the head and inspiration of the group. At her trial she never denied helping “enemy soldiers” to escape capture, though she did say it was entirely the soldiers’ choice, once they had escaped, whether they chose to return to the front and fight on. But this – and spying – was what she was found guilty of. Under German law she was sentenced to death for treason and shot. To the Anglican chaplain of Brussels who administered her last Communion, she justified herself saying: Patriotism is not enough; I must have no hatred or bitterness for anyone. History is all around you in Brussels. The city has a history that stretches back at least a couple of thousand years. But much of the ancient history is hidden behind more recent events. In particular, perhaps, the World Wars. There’s a whole district where streets are named for 1914-1918 battles – Paschendale and Ypres, Yser and Dixmude. And houses too. Just around the corner from where I live is Residence Joffre. This place isn’t named for the evil King of Game of Thrones, but for Joseph Joffre, first commander of the French army on the Western Front. 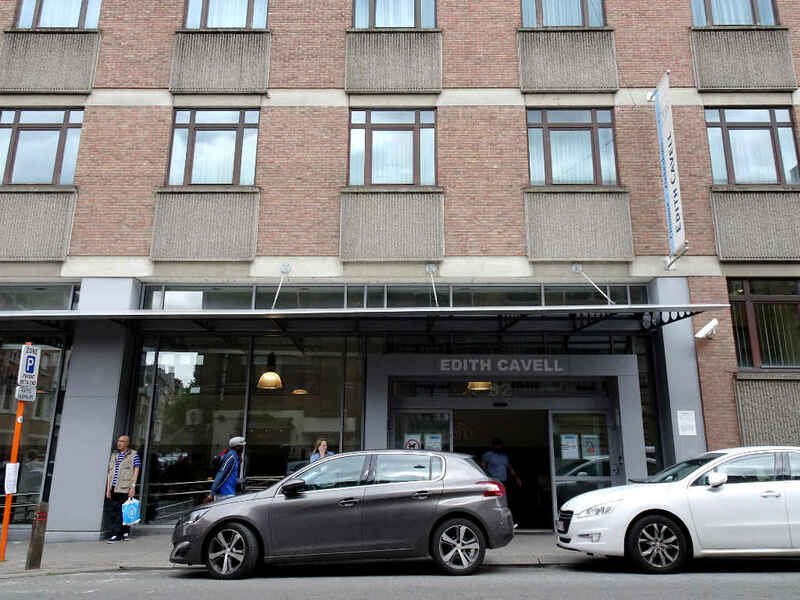 Still, I was surprised after we moved here to find myself one day getting off a tram at Cavell, walking along Rue Edith Cavell and looking up to see the edifice of the hospital – Clinique Edith Cavell… and then I remembered. We are going through a great many centenaries at present, and of course Edith Cavell’s was in October last year. At one of Brussels’ English bookshops it was easy to get a copy of Diana Souhami’s biography, the most recent scholarly account of Cavell’s life. (Souhami’s book informs much of this article.) Reading it I was fascinated to discover how much I must have been walking around Brussels in Edith Cavell’s footsteps. The four town houses knocked together that formed the original training school for nurses on Rue de la Culture are gone. They’ve been replaced by four matching houses built, I guess, in the thirties. The road is now Rue Franz Merjay, but it’s still is less than ten minutes stroll from the hospital on Rue Bruxelles. The hospital that was almost ready for her nurses to move into in the autumn of 1915. Rue Bruxelles is now Rue Edith Cavell and the hospital that bears her name is the same hospital, presumably much expanded. Up the road, on one of my morning promenades, is the Saint-Gilles prison where Edith Cavell spent the last ten weeks of her life, the last two in solitary confinement. 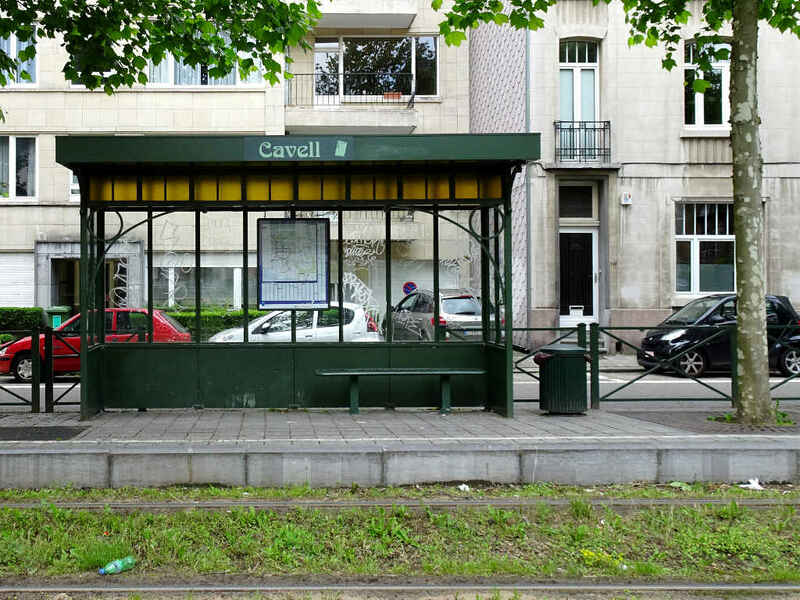 Across town, fifteen stops from Cavell on the number 7 tram is the Tir National – the National firing range. Here Edith Cavell was executed that chilly October dawn. 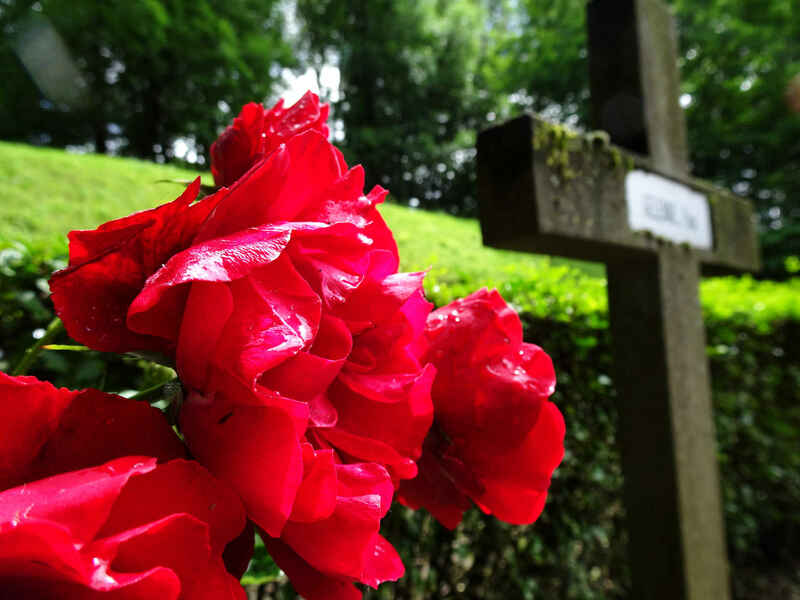 The Enclos des fusillés houses 365 graves – including at least some of the graves of the 35 people executed here during the First World War. The rest are for those killed here in 1940-1944. 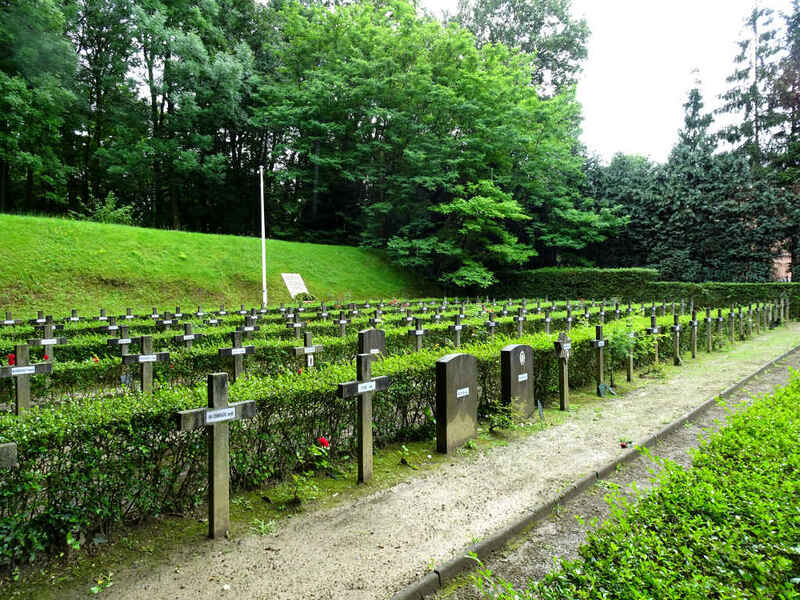 There is also a memorial housing the remains of Belgian victims of the concentration camps. As so many graveyards are, it’s a peaceful place now. At one end, the plaque that lists all the 1914-1918 dead rests against an earthen bank constructed to absorb bullets. Perhaps it is the very one against which Edith Cavell was shot. I sat on a bench and meditated a little on the dead and the vanity of national ambition. But I must have no hatred or bitterness for anyone. It’s hard to live up to, but worth trying. My thanks are due to Wikimedia Commons and the original photographers and uploaders for the picture of the Cavell Memorial in London and the portrait of Edith Cavell. 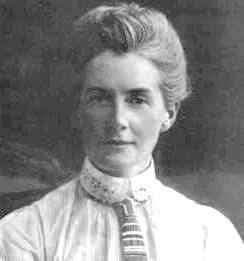 Also to Diana Souhami for her excellent biography Edith Cavell: Nurse, Martyr, Heroine. This is the homepage of the modern National Council of Women of Great Britain. I originally published this article on the separate Stops and Stories website. Transferred here with a little polishing for SEO and a new featured image 2 July 2017.